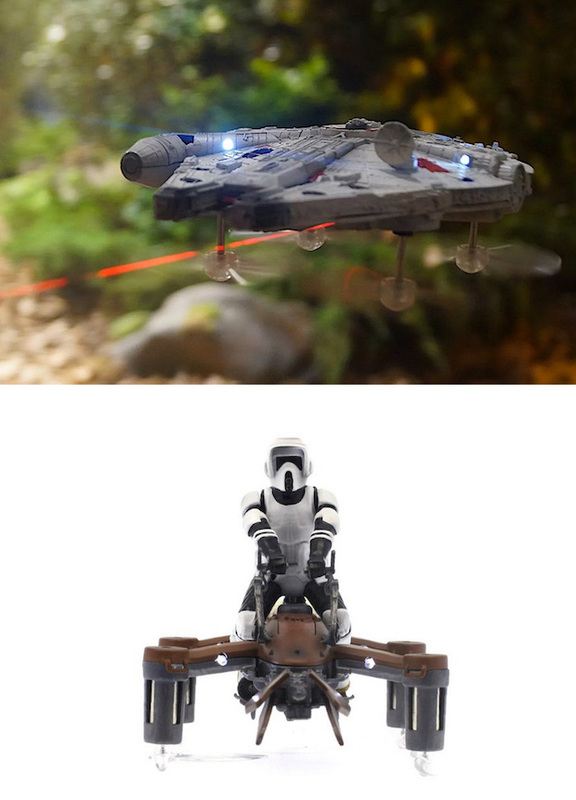 Battling Star Wars Drones Are A Thing That You Can Buy | OhGizmo! When we write about Star Wars merchandise, it’s usually just some stuff that looks like something in the movies, and doesn’t do much, like a lamp or a toaster or something. But these Propel RC Star Wars “Battling Quad” Drones are something else: they carry lasers that can tag their opponents, grounding them after three successful hits. You’ll thus be able to conduct some pretty gnarly aerial dogfights, since these are some pretty powerful drones too, reaching their 25mph top speed in only 3 seconds. They come in 74-Z Speeder Bike, Tie Advanced X1, T-65 X-Wing Starfighter, or Millennium Falcon variants. But since we’re talking about serious toys, we’re also looking at serious prices ranging from $325 to $400.